In a small pan, melt butter over medium heat. Saute onion until it begins to soften. Add garlic, lemon peel, wine and bay leaf. Simmer about 10 minutes, then pour over sardines. Marinate an hour. Serve warm or cold with fresh bread. I made Peter Reinhart‘s Italian bread, via Smitten Kitchen. We had this with some angel hair pasta (with zucchini, spinach and bacon) for dinner. Then the remaining sardines and toast served as my lunch the next day. Excellent mini culinary adventure and story. 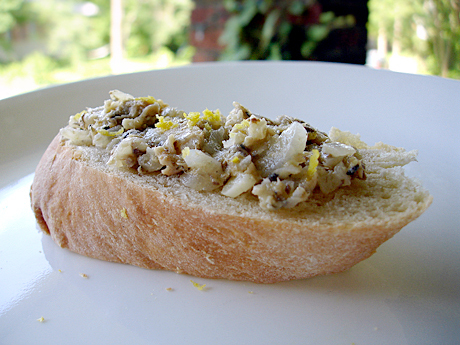 Most people think they do not like sardines, but many do after trying them. Growing up, my scoutmaster would always bring some on campouts. He favored the ones in mustard. I was dared to try them, and try them I did. Pretty tasty. Gosh, I love sardines. 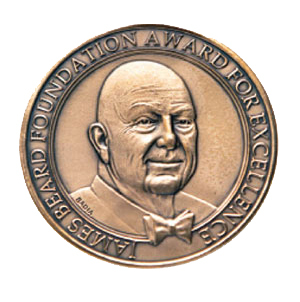 And James Beard. Although you are the first person ever to make me laugh at BEARD ON BREAD. Honestly, after years in this business, I’d never thought of it! I’ll never look at the book again in the same way. Did you know that Beard had a public shower installed on the fire escape at the back of his New York townhouse? Apparently, he, a fiercely corpulent man, took many showers out there, much to the horror of his neighbors who called the police and tried to have him arrested for indecency. Even today, years later, the shower is preserved on the fire escape at the back of the Beard House in New York. That definitely sounds like the best way to eat sardines. I think it’s the fact that they look like whole little fish that is so off-putting. This actually sounds good (especially with homemade bread)!